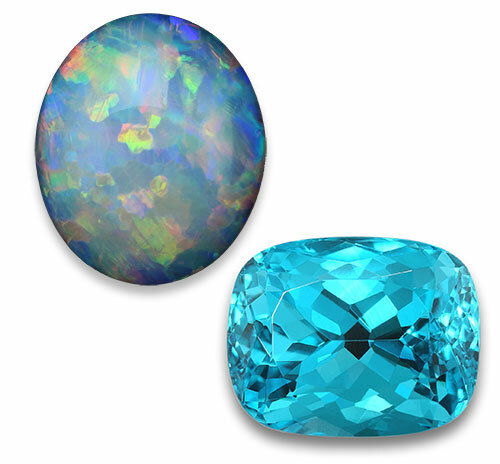 October features two incredible birthstones: opal and tourmaline. They each display an exciting and intense array of colors, making them popular choices for jewelry designers and collectors. The name “opal” derives from the Greek Opallos, meaning “to see a change (of color).” They range in color from milky white to black with flashes of yellow, orange, green, red, and blue. An opal’s beauty is the product of contrast between its color play and its background. Opal is a formation of non-crystalline silica gel that seeped into crevices in the sedimentary strata. Through time and nature’s heating and molding processes, the gel hardened into the form of opals. The opal is composed of particles closely packed in spherical arrangements. When packed together in a regular pattern, a three-dimensional array of spaces is created that gives opal its radiance. Approximately 90 percent of the world’s precious opal comes from Australia. The following are other countries that produce precious or fancy varieties: Brazil, Mexico, United States, Hungary, Peru, Indonesia, Honduras, Guatemala, Nicaragua, Slovakia, Czech Republic, and Ethiopia. Like fingerprints, each opal is totally unique! To get a really good look at the opals in these designs, click on the images below for a larger view. 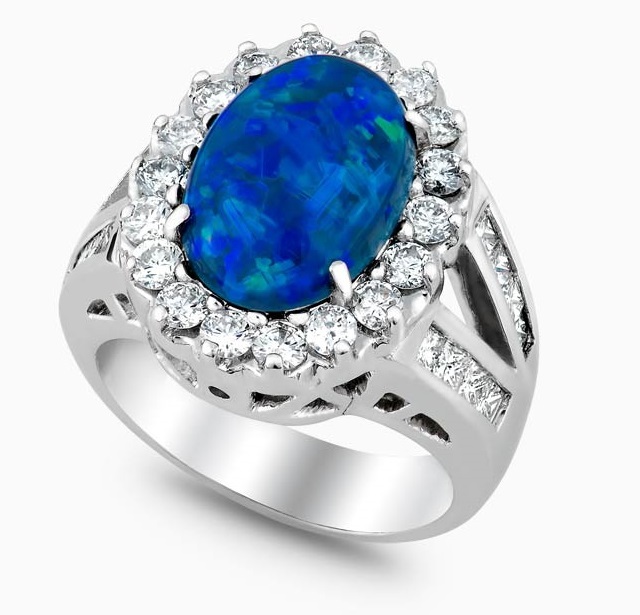 Blue-green black opal accented by fine white princess cut diamonds and round brilliant cut diamonds. 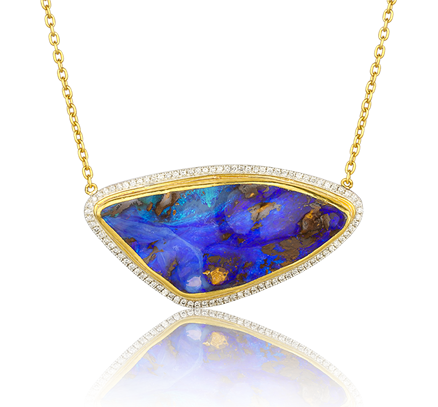 Sterling silver and 24k gold “Ocean” necklace, featuring a one-of-a-kind boulder opal framed by diamonds. 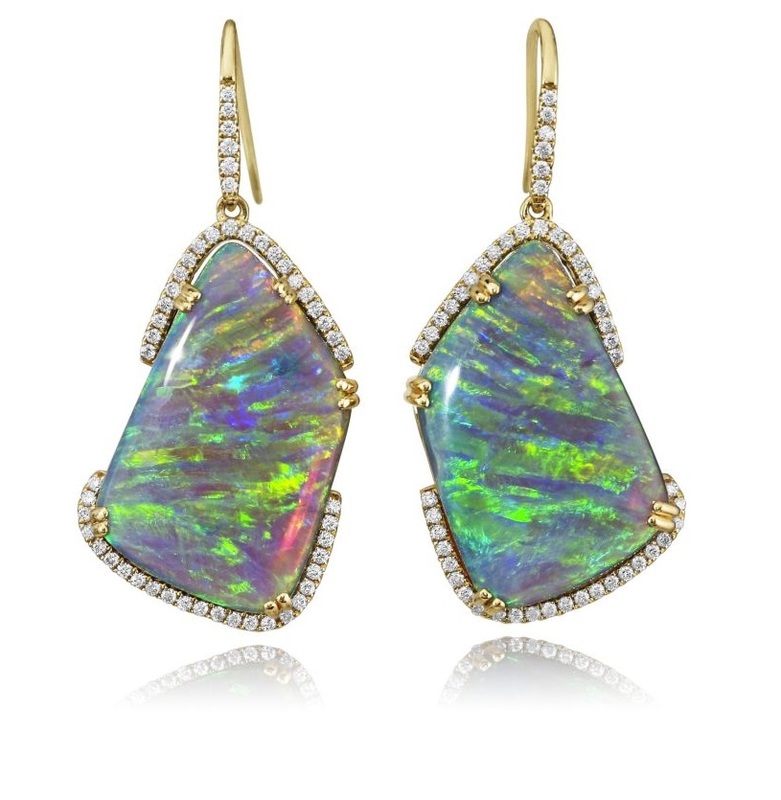 Australian black opal and diamond earrings set in 18k yellow gold. 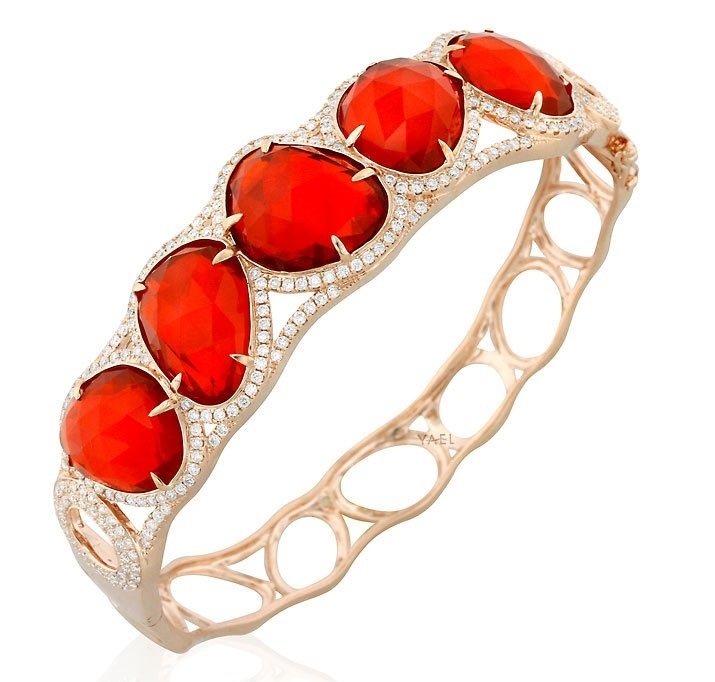 An 18k rose gold bracelet featuring rose cut fire opals and brilliant cut white round diamonds. Since tourmaline is available in a wide variety of colors, it is ideally suited to almost anyone’s taste. 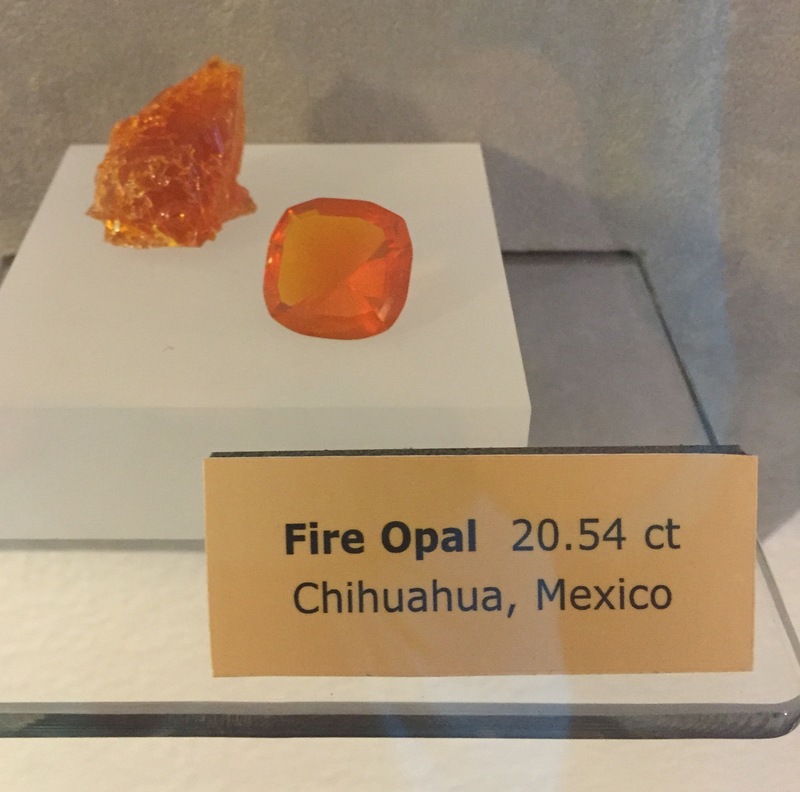 It is known for displaying several colors in the same gemstone. These bi-color or tri-color gems are formed in many combinations; the gemstones with clear color distinctions are highly prized. One multi-color variety is known as watermelon tourmaline and features green, pink, and white colors bands. To resemble its namesake, the gemstone is cut into thin slices having a pink center, white ring, and green edge. 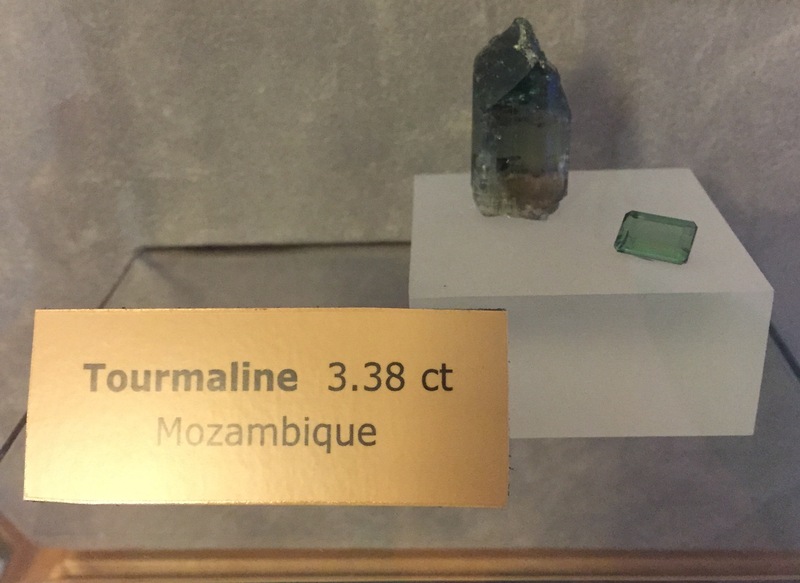 Tourmaline is found in many localities including Brazil, Afghanistan, East Africa, and the USA. 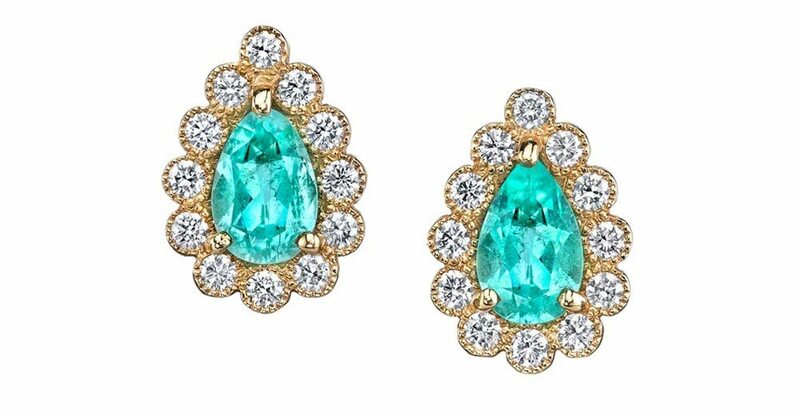 The following designs feature the varying hues of tourmaline. Click on the images to see a larger view. Paraíba tourmaline accented with diamonds. 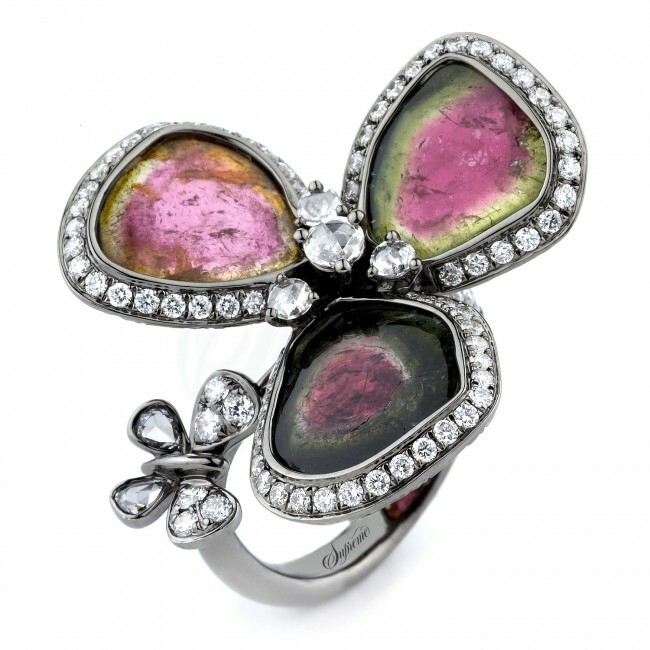 This unique ring displays a butterfly fluttering around petals of sliced tourmaline, framed by diamonds. 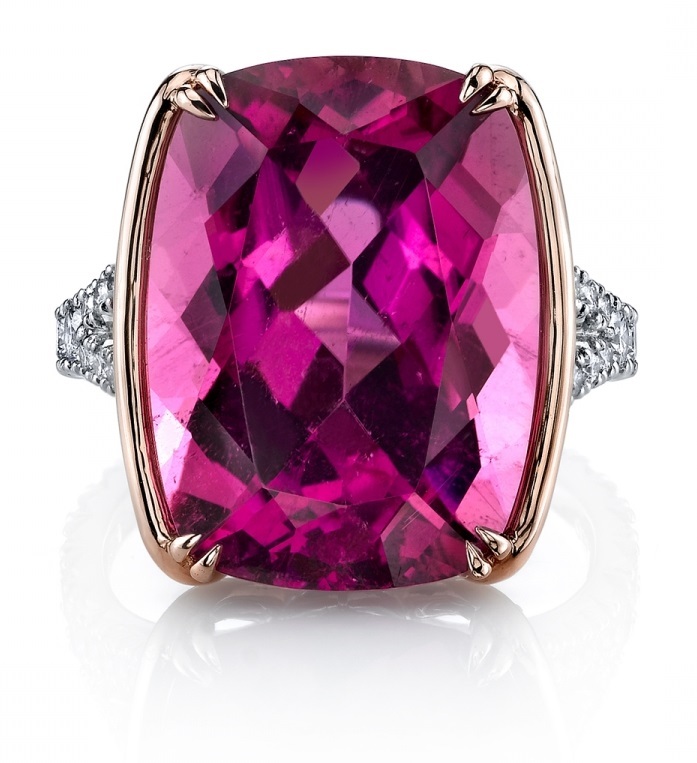 A cushion cut pink tourmaline and diamonds are set in platinum and 18k rose gold. 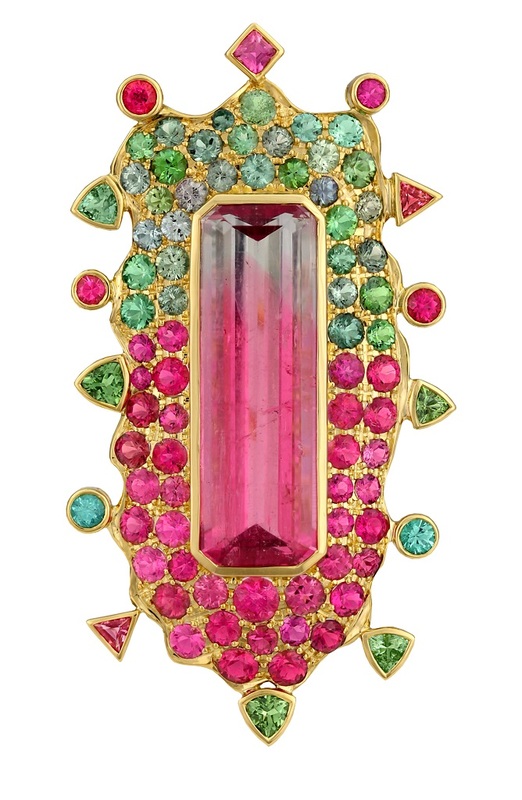 “California Dreaming” is an 18k gold pendant artfully displaying the many colors and varieties of tourmaline. On behalf of everyone at AGS, we send our best wishes to those celebrating a birthday or anniversary in the month of October! 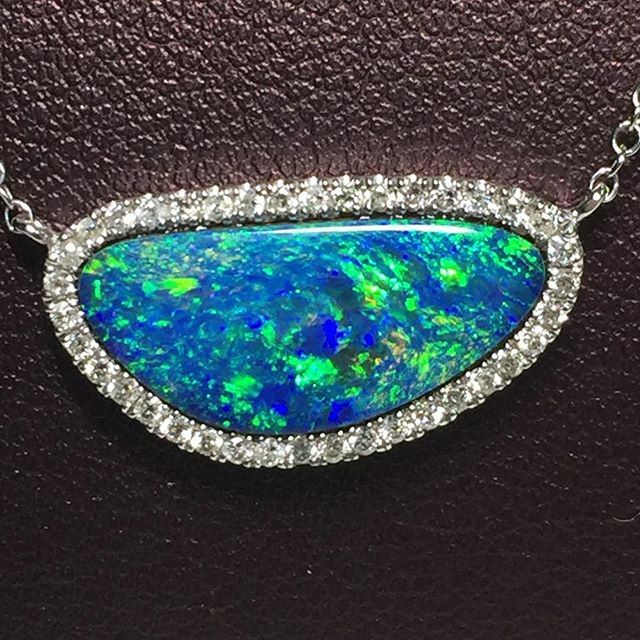 If you are shopping for opal or tourmaline jewelry, search for an AGS credentialed jeweler near you: www.americangemsociety.org/en/find-a-jeweler. Jewelry has always been a part of human culture, as well as the need to keep it clean. When it comes to cleaning gold—whether it’s pure gold or mixed—it’s important to know how to safely clean it so it can continue to shine. The following blog by Jewelers Mutual Insurance Company, How to Clean Gold Jewelry the Right Way, offers invaluable tips on cleaning your gold jewelry. Tourmaline has become a favorite gemstone among jewelry designers, and gem collectors the world over. Since it is available in a wide variety of colors, it is ideally suited to almost anyone’s taste. 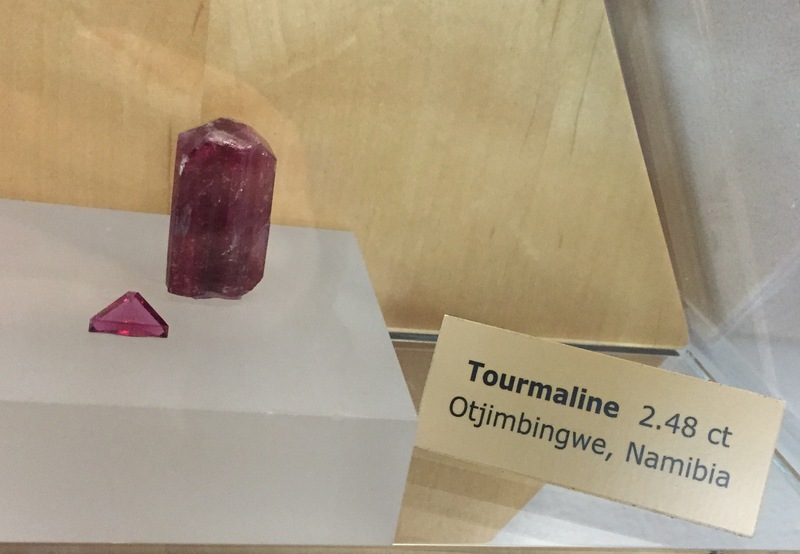 Tourmaline also is known for displaying several colors in the same gemstone. These bi-color or tri-color gems are formed in many combinations; gemstones with clear color distinctions are highly prized. One multi-color variety is known as watermelon tourmaline, and features green, pink, and white colors bands; to resemble its namesake, the gemstone is cut into thin slices having a pink center, white ring, and green edge. 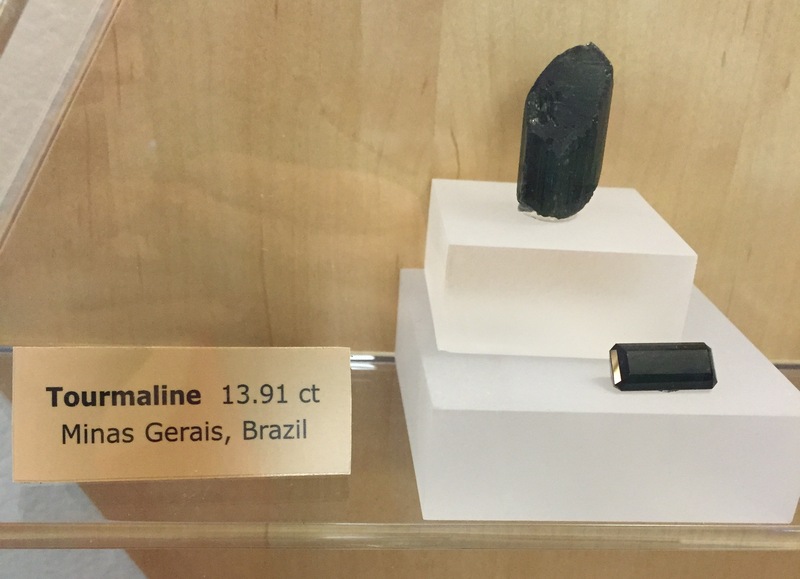 Tourmaline is found in many localities including Brazil, Afghanistan, East Africa, and the USA. 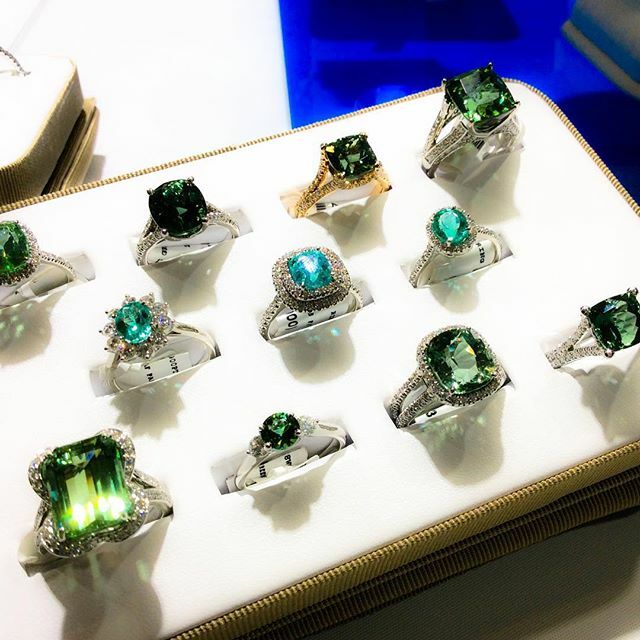 Tourmaline rings from Suna Bros. The name opal derives from the Greek Opallos, meaning “to see a change (of color).” Opals range in color from milky white to black with flashes of yellow, orange, green, red, and blue. An opal’s beauty is the product of contrast between its color play and its background. Opal is a formation of non-crystalline silica gel that seeped into crevices in the sedimentary strata. Through time and nature’s heating and molding processes, the gel hardened into the form of opals. The opal is composed of particles closely packed in spherical arrangements. When packed together in a regular pattern, a three-dimensional array of spaces are created that give opal its radiance. 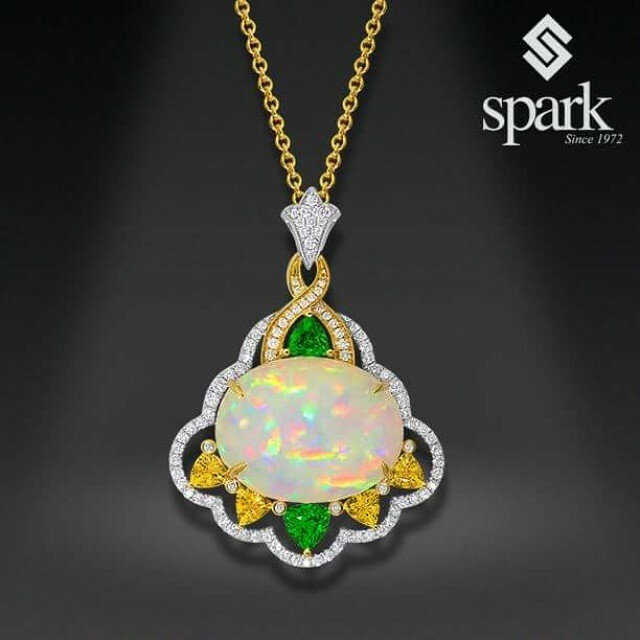 Yellow gold and Opal pendant from Spark Creations. On behalf of everyone at AGS, we wish all the October babies out there a very happy birthday!